The Google Daydream View is a brilliant piece of VR hardware. Its head-mounted display (HMD) is wrapped in a comfy fabric texture, with squishy foam on the inside. The head strap is easy to adjust. It’s ergonomically ideal and a little, invisible chip connects it to the Google Pixel phone with no effort. Tech outlets have sung the Daydream HMD’s praises since the hardware’s November release. But its best asset—its controller—has flown under the radar. I picked up one of these babies last night and spent some time testing out the remote. It is a very well-designed thing that I love and deserves a closer look. The Daydream’s controller is a wireless, ovular remote with four buttons: a circle and minus button on the flat top, a large trackpad button above it and, on the remote’s side, a volume button. The trackpad is all-directions responsive, so you can swipe from left to right to scroll through options, or swipe diagonally to, say, throw a stick to a dog. The Samsung Gear VR, maybe the most comparable VR hardware since it’s also for mobile, is controlled by a pad on the side of the controller. After significant time playing, your arm can tire of making adjustments by your head—it doesn’t welcome extended periods in VR. Other controllers are compatible with it, like full two-handed gamepads and a one-handed remote with a D pad, but while they have a lot of options, none quite approach the Daydream remote’s simple/effective ratio. 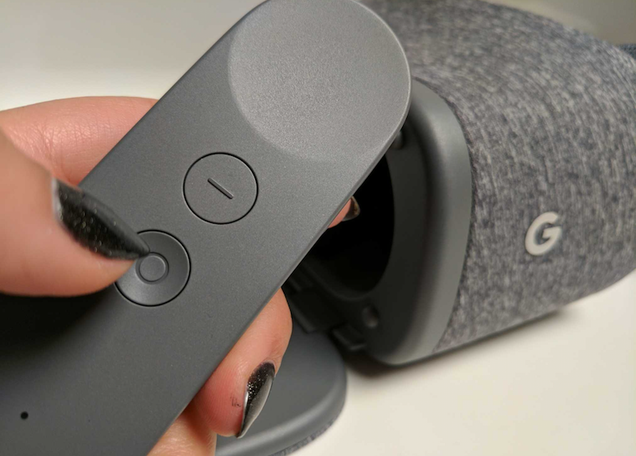 The Oculus’s remote control is most similar to the Daydream’s, with two medium-sized buttons in the middle and a large one on top. It’s not a trackpad, but a D-pad with four directions. On either side of the middle buttons are plus and minus buttons. I appreciated that the Daydream relegated those to the side of the controller, since in VR, it can be hard to feel out which button your finger is on when they’re all cluttered together on the front. The very fact of a one-handed remote instead of a two-handed game controller (or controllers) is significant. It’s got the same welcoming quality as a Wiimote, definitely unintimidating to non-gamers. A one-handed remote also invites more relaxed postures while you’re playing, since your elbows aren’t locked. It’s very nice for using VR in bed. After a while, it feels like nothing, since it’s so light. The controller also reports gyroscopic and accelerometric readings. So, for example, I played action RPG Twilight Pioneers on Daydream last night (yes, in bed). My remote was a sword, which I could slash by waving the controller around in any direction. It moved faster or slower depending on how quickly I waved the remote. More practical, these measurement tools mean that the controller can help make VR work better: When you point ahead and hold the circle button, the Daydream’s viewpoint will readjust to reflect where you’re facing, something I’ve found immensely frustrating with other VR hardware. It’s easy and surprisingly accurate for a controller Google is currently selling for $50 (Until February—the Gear VR HMD is $70). This is a sleek thing, friends. But versatile, considering it only has four buttons. As a noted VR skeptic, I was surprised at how the controller’s simplicity made the hardware feel less gimmicky. The Daydream’s remote (and by extension, the HMD) feels more like a tool than a commodity, since it’s polished but also designed to be totally accessible to real people and not just tech geeks. It’s definitely a step forward for a genre of hardware that, in my experience, a lot of game-players still consider very niche. Unfortunately, one thing I discovered with my new Google Daydream is that there’s a regrettable dearth of software for it. None of the three titles I chose from the Google store blew me away as much as the hardware did. When something comes along that really utilizes the remote, maybe I’ll stop laughing every time I hear the word “immersive.” Maybe.